We are absolute fanatics about the proper care of our beloved cashmere sweaters because we think of them as an investment. We want you to protect your investments! Don't let the dry cleaners ruin your fine cashmere and woolens - when you invest in quality winter wear, why pay the dry cleaners to shorten the lifespan of that investment? You do not need to wash or dry clean your sweaters in-between each wear. In fact, your clothing will look and feel so much better if you don't! Just as we are fanatics about our cashmere, we are just as picky when it comes to treating them. But when it comes to washing wool, not all products are created equally. We love The Laundress products because they are formulated to remove stains and dirt, while still being incredibly gentle on your most treasured pieces. Did you get a stain on your favorite sweater? Not a problem! Pretreat soiled areas with the Stain Solution or Wash & Stain Bar and pre-soak for most effective removal. Use the Wash & Stain Bar to remove stains like dirt, grease, and grime. Wet the bar and work into fabric. Keep items fresh between wearing and washing by turning your sweater inside out and spraying it with The Laundress Wool & Cashmere Spray. This spray is also perfect if you are just now getting your cold weather clothing from storage to banish any lingering musty odors. The Wool & Cashmere Spray is a nontoxic, allergen-free fabric spray. Its antibacterial properties add scent while removing odor and it's safe for all fabrics! After using the Spray, we then recommend using The Laundress Cashmere Brush which is ideal for removing lint and brushing fine yarns in between wearing and washing. Brushing the yarn rejuvenates the natural oils. 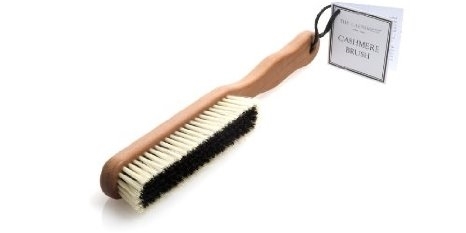 This brush provides the best possible care for your woolens. Is your sweater getting a little bumpy and not have that same lustrous look it once did? Use the Sweater Stone or Sweater Comb to de-pill. This will also keep your sweaters looking brand new! Which one you need, the Sweater Stone or the Sweater Comb? Well, that completely depends on what types of sweaters you purchase. The Sweater Comb is perfect for fine gauge yarns (think of ultra thin 16 gauge to the most commonly purchased 12 gauge). The Sweater Stone is better for your loftier, heavy gauge items (think of a thick yummy 3 gauge). Lay the garment on a flat surface and work tools in one direction. Don't rush the drying process. Lay the items flat in their natural shape on a drying rack or clean towel. Personally, we all use the towel versus the drying rack. Here's what we do: lay one item flat on a towel with the item in its original shape, roll it up in the towel (like a sleeping bag) to remove the excess water, then unroll and make sure any creases are quickly dealt with. When drying, avoid direct sunlight and heat sources, such as the radiator, because they can shrink or damage wool. Never hang wet wool. We believe that you must wash your cashmere (and other wool blends) with The Laundress Wool & Cashmere Shampoo to safely clean and preserve the sweaters. The Laundress recommends hand washing in cold water. Hand washing is always the best and safest method for washing woolens but if choose to cheat and use your washing machine, then use the hand wash or woolen cycle (always use cold water and low spin), and remember to turn the item inside out and insert it in a Mesh Bag to protect. Remove promptly from the washer to reduce creasing. Please NEVER use the dryer for your sweaters!! We recommend steaming the cashmere to remove any wrinkles the hand washing created. 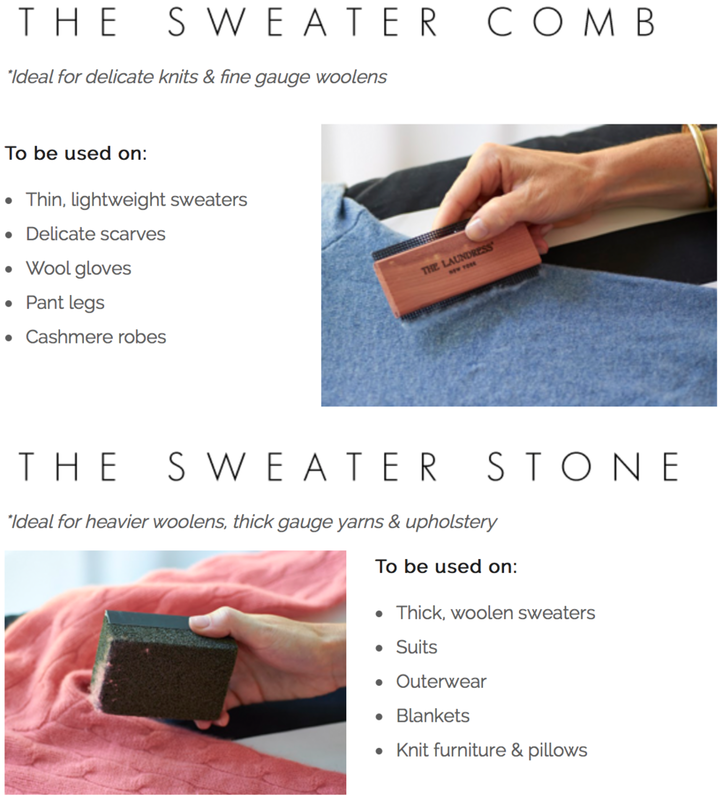 All information on the care and storage of your cashmere sweaters was gathered from The Laundress.